Do you have hard to reach, upper-story windows that need to be washed at your business and/or your residence? 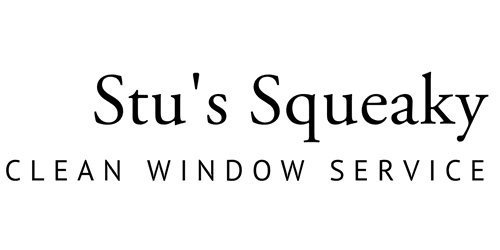 Call 'Stu's Squeaky Clean Window Services' and let us take care of your upper-story window needs! Utilizing our revolutionary "Pure Water Window Cleaning System,' we are able to turn the most difficult and dangerous jobs into amazingly easy and safe projects that can be completed in less than half the time other companies take! Our telescopic graphite/boron composite pole and brush setup can extend up to 48 FEET with ease to clean windows the other guys can't even reach without renting super-expensive equipment, or rappelling off of your building or home! We don't need dangerous ladders, ropes, harnesses, or ugly old scaffolding! We use normal tap water, sent through a super-high-tech 4 filter, pressure increasing system that takes polluted, mineral and sediment filled water through 2 carbon filters, a reverse osmosis filter, and a complete de-ionization system that removes up to 99% of all dissolved solids in our water supply!!! This means that only the purest water, just as God made it to be, is used to clean your windows! THAT MEANS NO SPOTS, RUNS, OR DRIPS!!! Call us today for a FREE estimate, and let our "Pure Water Cleaning System" work for you! Save hundreds of dollars by letting our amazing technology and stellar science do ALL of the hard work for us!!! If all pictures CANNOT be included, please consult me on which ones to use? If they can be worked into the body of the page's writing, that would be fantastic!! !